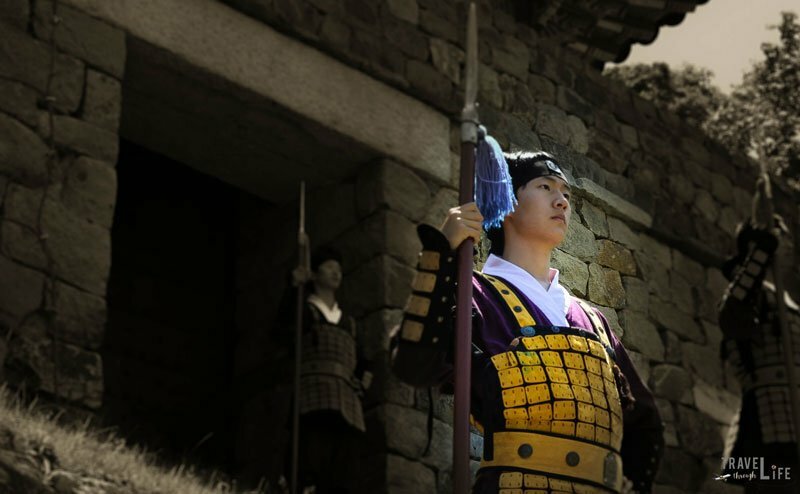 Days like this at Gongju Fortress (Gongsanseong) take one back to a previous era and also demonstrates why we came to South Korea. I don’t care about the tacky souvenir shop that my back is facing, or the construction and tractor easily visible upon entering. My hope is to relive something once crucial to a former kingdom’s existence. With a mix of history and today’s quirks, I’ve already fallen in love with Gongju Fortress. It’s long been at the top of my South Korea bucket list and should certainly grace yours. 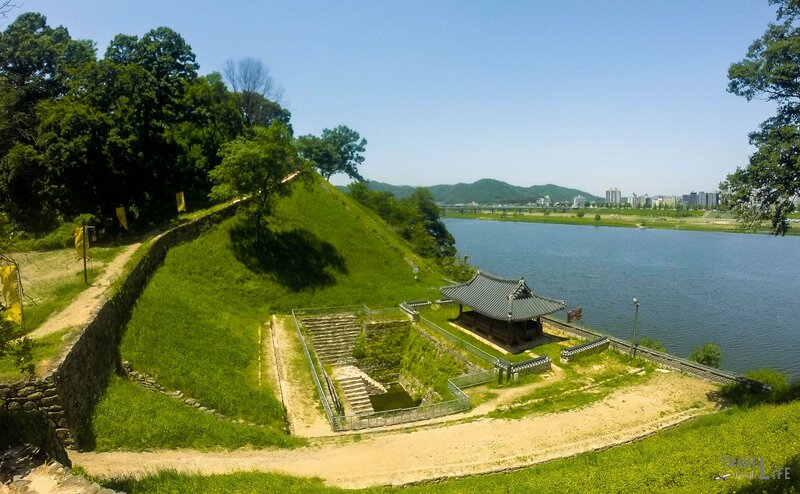 Note: Gongju Fortress is Closed on Major Holidays (Chuseok and Seollal). We arrive in Gongju early in the morning and just in time. A man beats a drum in the distance and keeps time to the pre-recorded music. I’m trying to capture the guards and their colorful garb along with the green grass in the background, but brown dirt and dead leaves dominate my wide lens. Christina does a much better job with our Nikon. The ceremony is moving along, full of intense noises and sounds all around. I notice that my wife and I are the only people here without children tagging along. This always seems to happen to me and makes me wonder why the other childless people in the world like stuff like this. Is there anything wrong with a kid at heart like me? 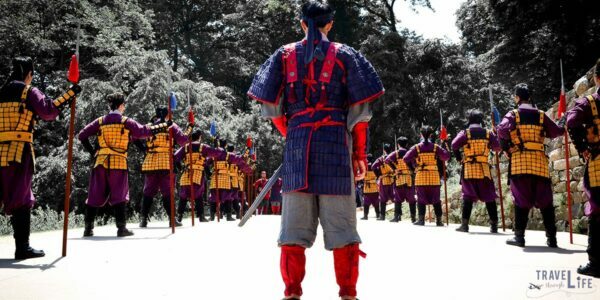 The guards’ attire and intense posture properly convey the idea that this former dynasty—the Baekje (Paekche)—was in trouble when they chose Gongju (née Ungjin) as their capital. They’d spend a little over 60 years here (475–538) until moving onto Sabi in present-day and nearby Buyeo. Gongju proved an important stop for the Baekje, as they strengthened their cause here before moving onto the better-situated Sabi. Bringing my mind back to the ceremony, things are getting intense. More music and cool choreography from the sword-bearing guards and at this point, I’m envious that Koreans can recall this type of stuff—1,000-year old traditions. Seeing this instills a newfound appreciation for Korea’s historical preservation, no matter how staged and fabricated some places become. After the 15-minute ceremony, it’s business as usual with selfies and jockeying for the best shot available. We break away from the crowd and walk along the fortress wall. Even with the occasional intrusion by a family or group, I can go back and try imagining a life before this one. Magpies and other colorful birds stop and take a break on the path before moving back into the air. I can never get over the former’s wonderful blue-tipped tails fluttering about. We continue through the tree-covered path, noting that spring is moving nicely into summer and giving this Saturday a beautiful green background to enjoy. Walking around the path along the wall is a true contrast from the noisy main gate and the crowds snapping selfies with guards. We walk around the area and temple where warrior monks once fought against the Japanese in the 1590s. Though I didn’t see any hint of them, walking through the area reminds me of Simon Bond’s spectacular photos of warrior monks. His perfect execution of those scenes will be forever burned into my memories. We spend the rest of our day walking along the 30 meter-high wall with no guard rail. I’m happy that we woke up early on a Saturday morning to drive out here. The day is not over yet, though, and we keep moving. The circular path leads us along the Geum River to the Manharu Pavilion, where a lotus pond was once a popular spot for rest and relaxation during these troubled times. Walking through the beautiful shadowy walkways and back into the sun, another ceremony sounds like it’s on the way. They happen every hour and it makes me realize the quickness of our walk around the fortress. 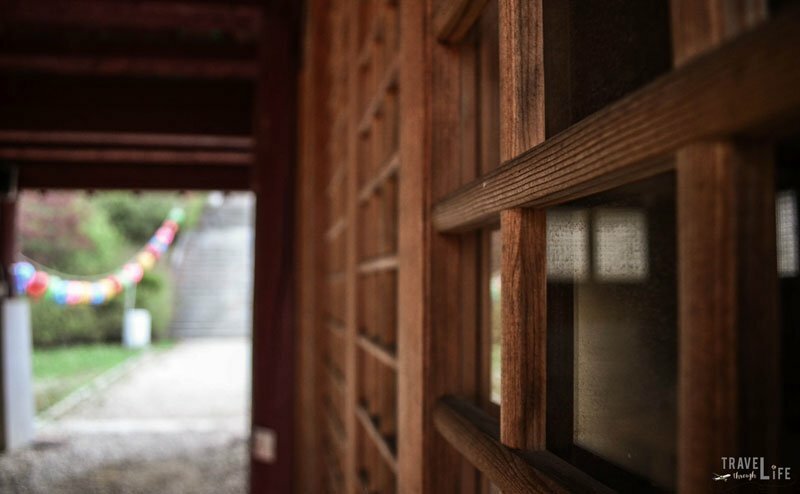 We head across the street for a meal and head onto the next piece of history, in Buyeo. This guide is part of our series on South Korea Travel, East Asia Travel, and Asia Travel. It was originally created on July 20, 2017. It has been maintained and updated on our blog (as of December 27, 2018) to reflect current viewpoints and travel destination trends. LOL, one day (hopefully soon) we’ll be the other childless couple at the family events. It looks amazing, just the sort of thing we’d love to see. Beautiful pictures and such a great read. Those other childless people are missing out on the pageantry and history of this place and the changing of the guards. We always try to make an effort in watching the guards. What a beautiful place to visit and spend a few hours. As always, I really love the way you use your subheadings. It really makes me want to continue reading. I also especially love how you wrote this post in particular… I like how you started out in present tense. It made me feel like I was actually there, too. Great prose! 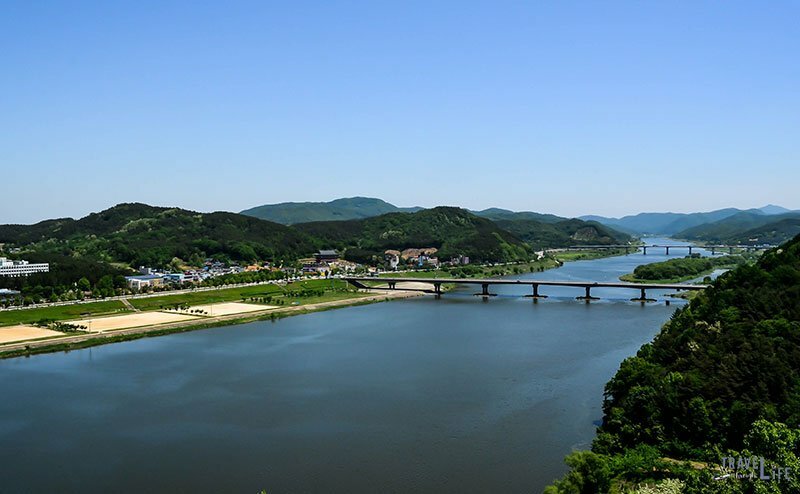 Have you ever gotten a chance to visit Gongju? Just last weekend I was riding the KTX and their chair-back magazing was featuring Gongu-si. I was thinking, “man, I’d like to go to Gongju and check out this fortress!” and now I read this! As always, thank you for recounting your tales with a mixture of history and personal experience. I think that many people forget context and just think about how something has lasted, not from where and when it came. I always enjoy your posts and this one is especially good. i hope to visit this fortress later this year, and having your tale in my head will surely enhance the experience. Thanks a lot, Ryan! I was on the train recently and also saw that article. Cool that they featured it, huh? Anyway, thanks for your compliments and I hope you get to stop by in the near future as well. Very interesting place. I haven’t even heard of this place before? You seem to travel to all the places I have never/ will never visit. I had a good laugh at the part where you wrote that people forget your camera is actually taking photos…I’ve noticed that Koreans can be so careless at times / just don’t care if they ruin your photo. Lol, thanks for having a laugh “with” me. Better than laughing AT me, right? Anyway, it can be a bit frustrating when I think I’ve got that perfect moment and…. one person just unknowingly/carelessly gets in my shot. I’m serious when I think I’ve just gotta get faster. People will always be.. well people I guess. Hope you enjoyed, Rafiqua! Welcome back to Korea, btw. You’re right, keep moving. I hope that this time around, your stay in Korea is much better than before you hit rock bottom. Our round 2 here has been pretty rad! Unfortunately, it’s coming to a close at the end of summer:( Looking to make the most out of it though! Nice photos and interesting. We missed this stop while we were in Korea. Guess we will have to come back! Ah, such a bummer. Gonju was small but the fortress was pretty rad! I hope you get to come back! Beautifully written with beautiful pictures. This post tells a story and entertains. I haven’t been to Gongju but I stayed at Gyeongju last year. Charming place. And your post about it is also full of beautiful pictures. Thanks so much for commenting, Wendy! Gongju is a bit far from Gyeongju but closer to Seoul for those who live in that area. I appreciate your compliments and hope to hear from you again. Take Care.